Hello! My card was created just for you today, sharing my love on this sweet, Valentine week. 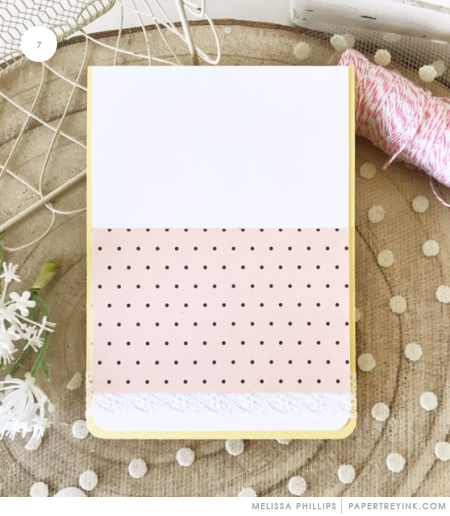 I’ve got hearts hidden and tucked in here and there on my card, showing you that you can use hearts in unconventional ways. I began by using Stamper’s Select White cardstock and the Shape Shifters: Oval 4 die. 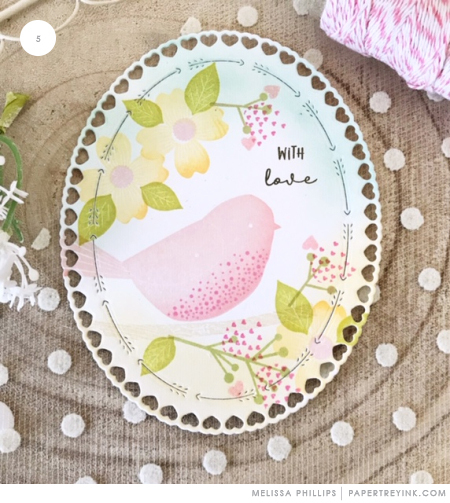 I stamped my bird from the Give Love stamp set in Sweet Blush, Pale Peony, and Hibiscus Burst. The stem was stamped in Fine Linen ink. Next, using Spring Moss ink, I stamped my tiny stems. These are also from the Give Love stamp set. The flowers were stamped in Lemon Tart, Summer Sunrise, and Sweet Blush. They are from the Warm Regards stamp set. I adore both of these darling sets! Limeade Ice ink was used for my leaves, and they are scattered around the flowers. 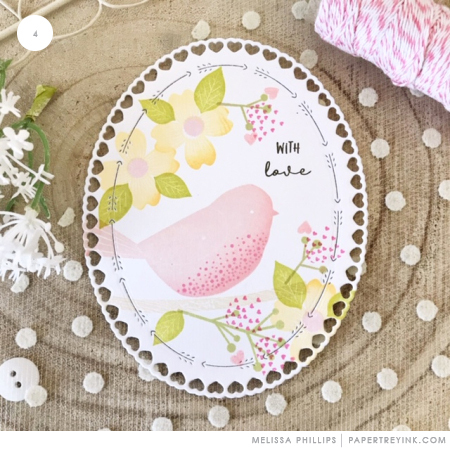 Isn’t is fun how each new stamped image adds so much personality? Now for the hidden hearts :). I used the You Make My Heart Soar stamp set and selected the tiny group of hearts. I added them to mimic berries and stamped them at the ends of my Spring Moss stems using Hibiscus Burst ink. I also used a single heart from this set, stamping in Pale Peony ink. Can you see the hidden hearts? My sentiment is from the From the Heart stamp set and was stamped in Olive Twist ink. Lastly I added a bit of sponging in Aqua Mist at the top and Lemon Tart at the bottom. I love the soft feel that sponging adds. To build my card, I started with a Harvest Gold cardstock base. I rounded the bottom corners before adding my block of Stamper’s Select White cardstock, also rounding the bottom corners. I then added a bit of trim across the bottom of my card and layered on a coordinating piece of patterned paper. Before layering on my focal point, I added a bit of aqua seam binding, tying it in a bow near the top corner. 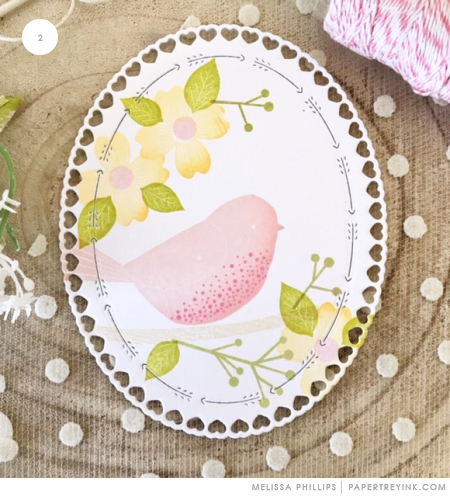 To finish, I decided to give my card more dimension, and added a fussy cut bird image with a leaf from the Give Love stamp set for its wing. I stamped the wing in Hibiscus Burst ink. I then added Sweet Blush buttons to the centers of my flowers. Sometimes I don’t have time to sort through all of my dies to find a certain die collection. That was the case with this card and the Give Love collection. So, I just used my scissors and it turned out just fine. So, if you find yourself with a stamp set and no die collection, remember you can still add dimension just by fussy cutting your images. You WOW me every time ! Love everything about this card ,especially the hidden hearts. Lovely card! The layers of interest are fantastic! 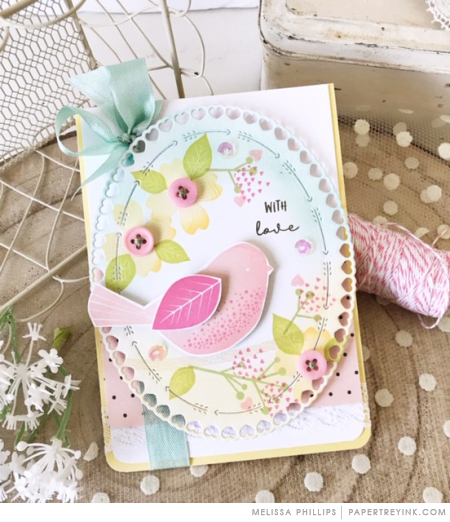 Beautiful pastel card making me happy while I look out my window at a cold foggy morning. Thanks! 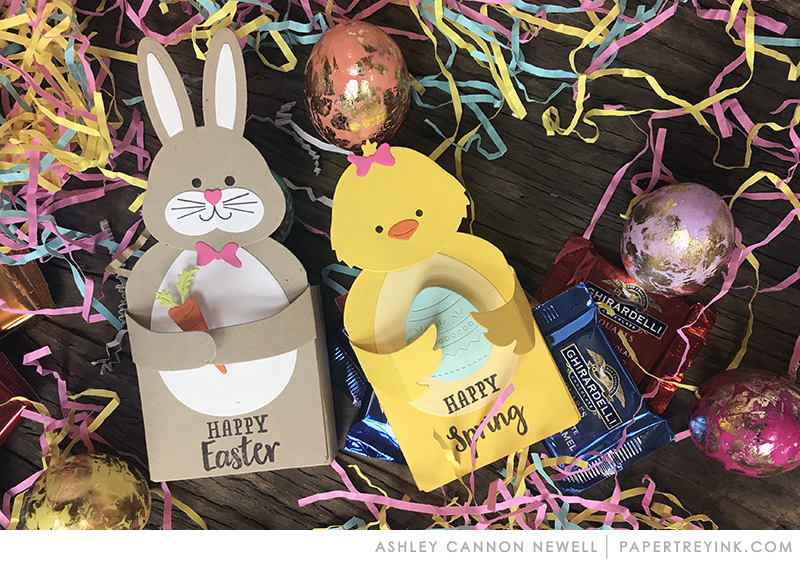 Melissa – as always, I love the cards you create. You are so very talented and I appreciate your sharing your talent with all of us. This is breath taking, just beautiful! 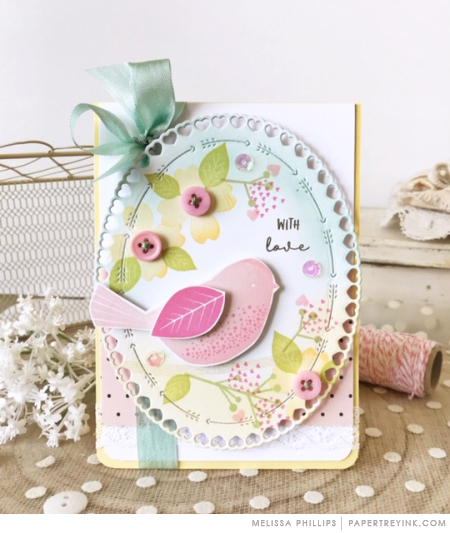 And I love the gorgeous oval die as well as happy to see a birdie! This has got to be my most favorite feature! love seeing the process of how your cards are created! What looked so intricate is broken down into steps that I feel like I could actually recreate! Love, love this!! Happy Valentines Day to you Melissa! One of my favorite dies, the Oval 4! So beautiful is your card! So very pretty! I love all the details you included, and I love the way you walk us through the creation of this project! I LOVE seeing how every layer comes together and the details you add to make it even more beautiful! Thanks so much for sharing, Melissa. This super pretty card is one of my favorites. The sponging completes the soft look. Wow, what an inspiration of beauty and technique! Melis, you have created a masterpiece. This is just beautiful! Your card is amazing!! 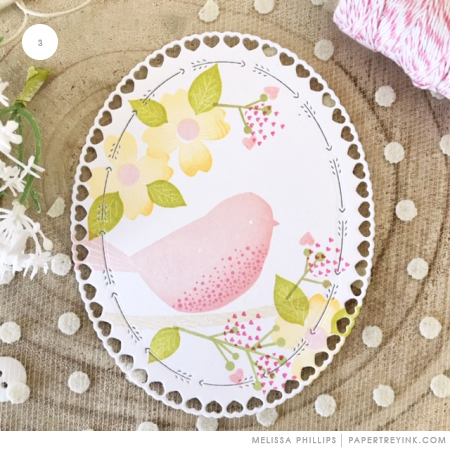 Melissa, once again you have designed a beautiful card with clever elements and fun surprises. Your use of color makes all the difference. You chose muted colors that enhance the overall look and feel of this gorgeous Valentine. Wishing you a lovely day. another gorgeous card. such soft colors and sweet images. somehow on such a small canvas you manage to put something of interest on every square inch of the card. 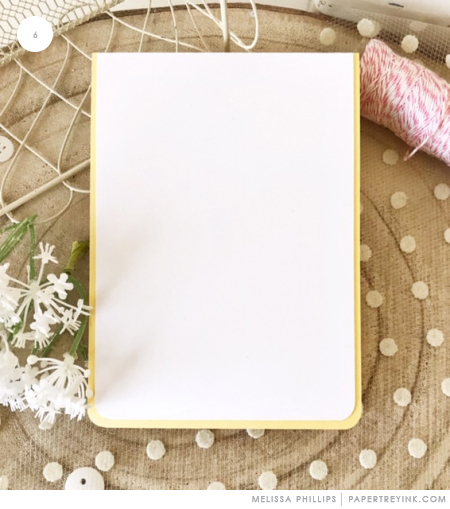 I love seeing your step by step process to create your cards. love your style. Hidden Hearts…perfect! Great, detailed instructions, Melissa. What a beautiful spring card. I always love your soft colors and layering. Thank you for showing how you put your cards together. Is there any special place you buy your layering print papers from? Happy Valentines Day! This is such a gorgeous card. I absolutely love it!!!! This card is absolutely stunning! WOW WOW WOW! So so pretty! One of my favorite “Melissa cards” ever! So gorgeous & creative! Beautiful card, love all the hidden hearts ! This certainly is a feast for the eyes! Melissa, I study every single one of your cards, and search out and appreciate every little detail that goes into them! I am THRILLED that every Monday there will be a lovely present for me in my inbox. Happy Valentine’s Day! Beautifully done, Melissa! I just received “Give Love” stamps/dies in today’s mail and can’t wait to try to CASE your amazing style! Thanks for all the details on your lovely artwork! Such a beautifully layered card. You never fail to impress me with your creative joy. Thank you. I was just looking at your older card, and into the wish list went a few of the products from them. Wow, what a beautiful card, Melissa! Love the softness and the layering! So so gorgeous Melissa. This card is so feminine. I just love your stamping style so much. 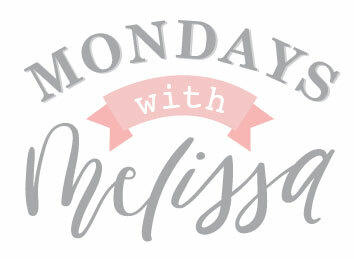 The stamped images that Melissa adds to her designs is one aspect I love about her style. It’s a real treat to “sit” in with her and watch the step by step process. A big thank you to her for a lovely card! What a beautiful card- love all the details! 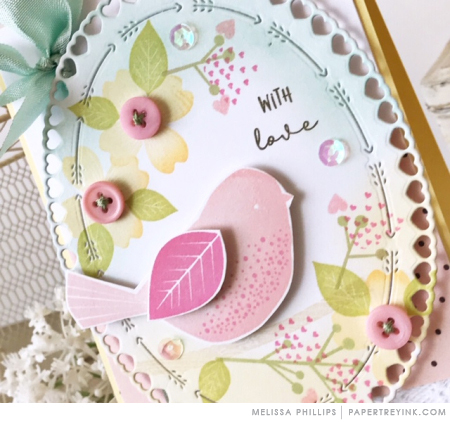 Enjoy seeing how Melissa creates such gorgeous layered cards with so many added details. 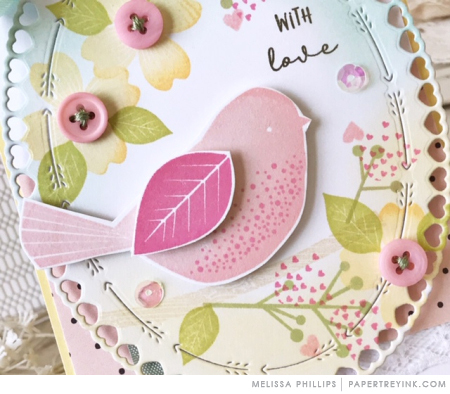 Gorgeous card, Melissa! So clever to use the tiny heart for berries and the leaf as the bird’s wing is genius. After seeing this lovely card, I ordered the stamps and dies to make it. I would love to see a video showing how you (Melissa) makes bows. love. Love. 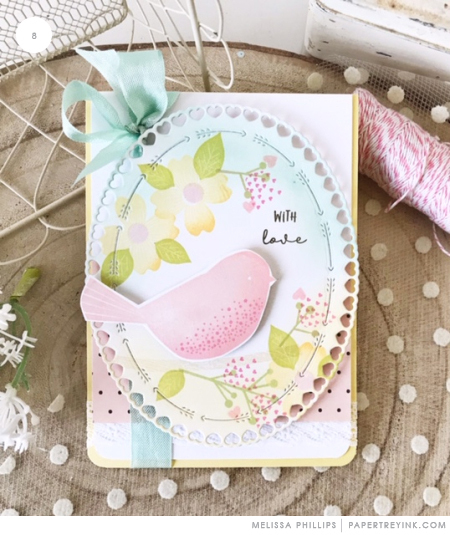 LOVE this card… and thanx for the step-by-step instructions on how you stamped the images. 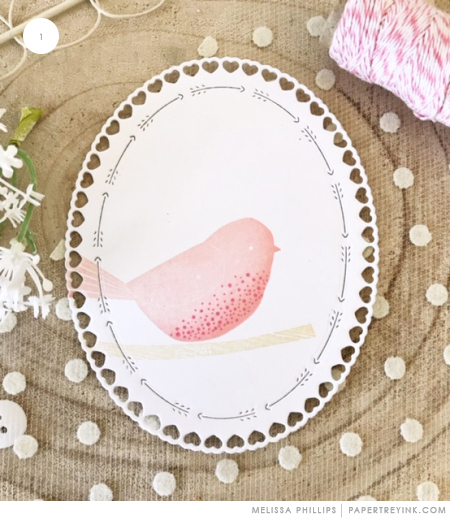 it’s interesting to see how the card developed… and I love the popped up bird w leaf serving as its wing!